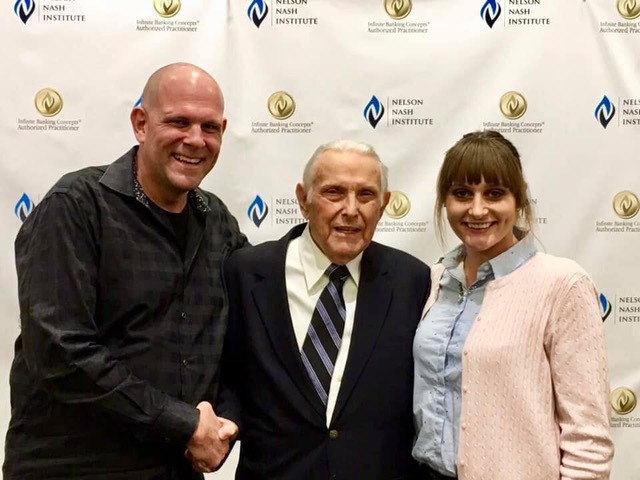 My heart is very heavy… Wednesday, March 28th, 2019, R Nelson Nash would say he “graduated.” His teachings have changed the financial life of myself and also my family forever. I am able to now serve and teach his message to so many other people and help change and improve their financial lives as well. He showed me the power of knowledge, passion, and caring. Nelson you are missed so dearly and you will never be forgotten. You have left a legacy of truth and change. RIP my friend and mentor. R. Nelson Nash, the founder of the Infinite Banking Concept, is still a man with an infinite legacy. With his passing this week, he leaves his family, his friends, and all of us a the blueprint of financial freedom. When Nash first bought himself a whole life policy in the late 1950s, he had no idea what program he started. It wasn’t until the early 1980s, in the midst of a personal financial catastrophe, that Nelson, on his knees, begged God for some clarity and hope, and got an answer that changed it all. Unbeknownst to him, more than twenty years earlier, he had unwittingly began a banking system that would bless his household, his family, and all of us forever! Because Nash’s eyes were opened to see things that most people have misunderstood, the Kesler family, and all of our members are in a position of monetary control for generations. I am most grateful for his message as I personally paid off nearly a million dollars in consumer debts in just a few years because of what he wrote in his book: Becoming Your Own Banker. But, things didn’t end there. With the information that Nash discovered, his commitment to teaching it to others through his books and institute, my family and yours will never be the same! At The Money Multiplier, we carry out Nash’s vision of using dividend-paying whole life insurance from mutual companies to take control of the flow of money in our member’s lives, and “free families from financial failure.” As I always say, most people don’t even realize what terrible situation they are even in until we shine the light on the mysteries and myths of money. With Nash’s graduation, we can truly say, he was the head of the class!